This is my second viewing of Double Indemnity, and my first time where I actually had to study it critically as part of my Women in Film class. The first time I saw the movie was for an earlier film class and while I enjoyed it, I didn’t consider it anything special (it was certainly no Big Sleep). In watching it a second time I enjoy it far more, but it’s still no Big Sleep. If you haven’t seen The Big Sleep…..see before I find you! Walter Neff (Fred MacMurray) is an insurance salesman for Pacific All-Risk. 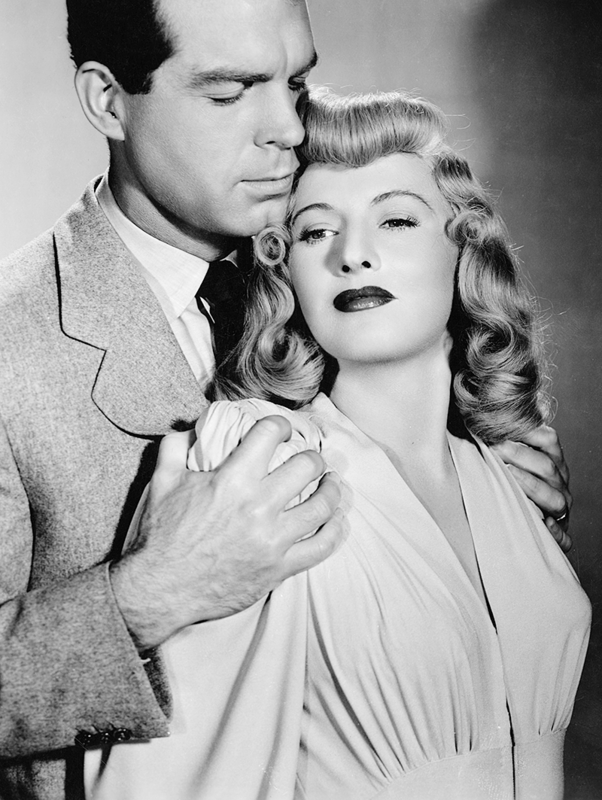 In trying to close a sale he meets the beautiful Phyllis Dietrichson (Barbara Stanwyck) who wants to covertly buy her husband some accident insurance. In collaborating together Walter and Phyllis plan to murder her husband and collect the insurance money. 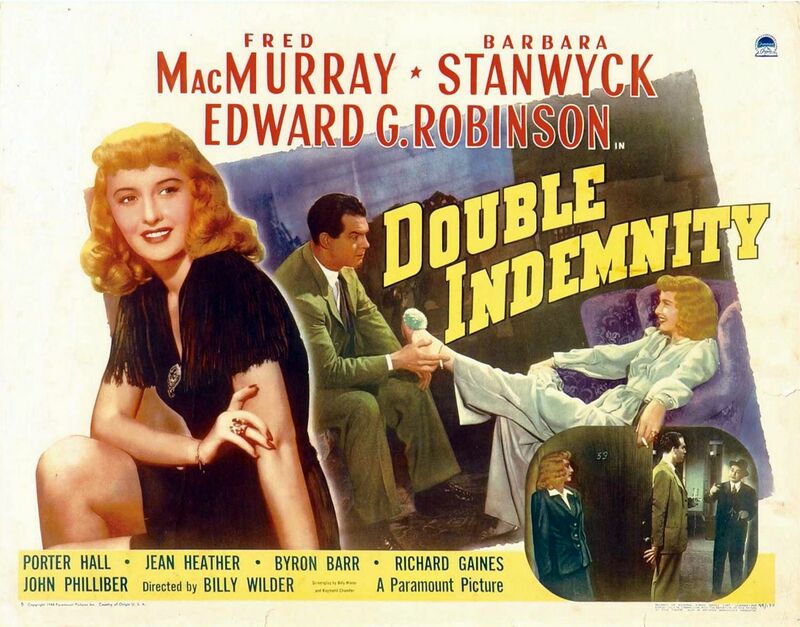 When its discovered Mr. Dietrichson (Tom Powers) is set to go on a business trip on a train, the two realize it will trip the double indemnity clause doubling their money. When Walter’s friend and claims manager Barton Keyes (Edward G. Robinson) starts investigating, the death of Mr. Dietrichson puts Walter and Phyllis in a tight spot. Double Indemnity is a classic in the film noir genre and is right up there with Out of the Past (which I reviewed previously). Where I think this one is better than Out of the Past is in terms of the sexual tension. Every line out of Walter and Phyllis’ mouth is sexual, to the point where my glasses started to fog up! From the minute the two are introduced, with Walter giving her a smirk and Phyllis in a towel these two are about thisclose to jumping on each other. After that all bets are off as Phyllis uses her feminine wiles to convince Walter to murder her husband. I’m not a huge MacMurray fan if only because he did such a great job playing a total asshat in The Apartment, so I haven’t trusted him since. This was the first Barbara Stanwyck movie I’ve seen and since then I’ve seen at least 2 others. Oddly enough, four years before this Stanwyck and MacMurray made a sweet Christmas romance called Remember the Night.…that had to be awkward in reteaming for this. The classic film noir tropes are all established here. The dark lighting, the way the only light tends to be the slits through the Venetian blinds or the light off a match. Phyllis is highly sexual and duplicitous, turning on the waterworks and relying on the dependence of men to make them believe everything is their idea. When Walter realizes he’s been had Phyllis has to remind him “you planned this.” The element of control is tenuous throughout this entire movie and when you think one person is in control, they’re not. Fate also deals heavily in this movie as throughout there are moments where one thing goes wrong and everything could end badly. After Phyllis and Walter dump Mr. Dietrichson’s body on the tracks the car won’t stop. The fickle finger of Fate playing a cruel trick once again. That leads me to something I noticed on this second viewing; how Walter is continuously surrounded by women! He mentions numerous times that Phyllis pervades his thoughts and women don’t leave the entire movie. There are female secretaries in his office. He meets Phyllis at a grocery store where women are everywhere. He even references Fate, and in classic mythology the Fates are women! This makes his downfall even more bittersweet as it seems to be utterly inescapable. The acting is all top-notch with Stanwyck continuing to thrive as the two-faced femme fatale! Edward G. Robinson is also good and has a sweet bromance with MacMurray. While I’m not a huge fan of this movie in comparison to others, it’s a staple in one’s film noir education and a damn fine movie. Great, great film. This was my first encounter with both MacMurray and Stanwyck, and they have terrific chemistry here. I also loved Edward G. Robinson’s role in this one. Definitely a must see for any fans of Film Noir.